If you collect or admire Indian art and antiques, you owe it to yourself to see “Maharaja: The Splendor of India’s Royal Courts,” now through April 8, 2012, at the Asian Art Museum in San Francisco. Organized by the Victoria and Albert Museum in London, the almost 200-piece exhibition features fashions and furniture, paintings and fine jewelry, and plenty of weaponry, from flintlocks used by carefree kings on hunting excursions to the daggers and swords carried by their somber guards. 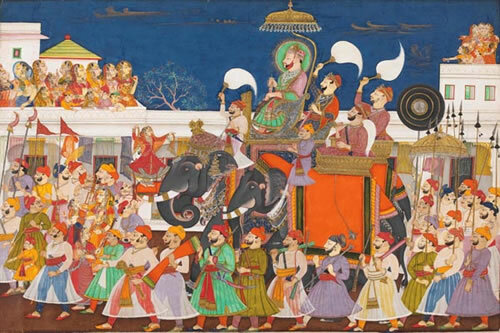 A watercolor depicting the procession of Maharao Ram Sing II of Kota, circa 1850. 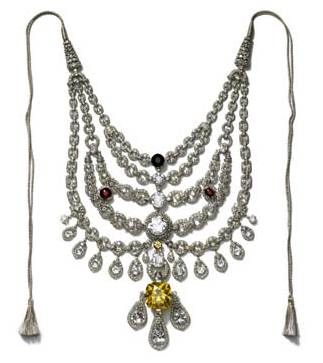 This Cartier necklace was created in 1928 for Sir Bhupindra Singh, Maharaja of Patiala. The reason why the show’s historical timeline is so engaging is because it’s fleshed out by the pieces on view, which are often jaw-dropping, especially the jewelry. Examples of personal adornment range from elaborate hair and ear ornaments (we’re talking a whole lot more than mere earrings, here) to the Patiala necklace, the largest necklace ever commissioned from Cartier. Though eventually cherry-picked for some of its most-prized stones, including a 234.69-carat DeBeers diamond, the Patiala necklace is still a marvel to behold, as most of its original 2,930 diamonds are still in their settings. Some of the sapphires and diamonds in other pieces are similarly breathtaking (the maharajas collected for quantity and size), while rubies are sprinkled on turbans and jade pots like so much confetti. Four enormous diamonds anchor this silk brocade belt, from 1850 to 1900. While the early maharajas are presented as spiritual warriors, they appear to have had plenty of time for leisure activities. 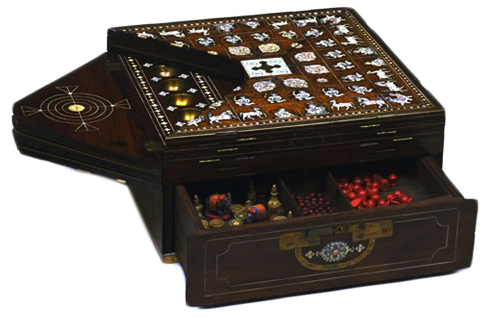 An early 19th-century flintlock decorated with gold and enamel is one of the most exotic guns I’ve seen (one can easily imagine the Sand People in Star Wars carrying these things), while the games box made of an Indian rosewood called shisham (see image at top), from roughly the same period, is inlaid with ivory and brass because, well, it could be. You might not be able to collect like the maharajas, but this window on their world is the next best thing. 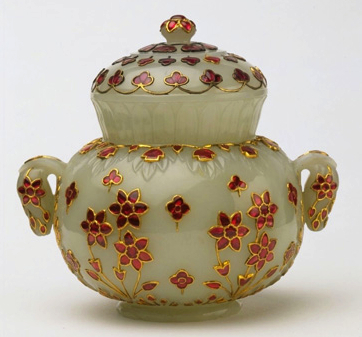 A white nephrite jade covered pot from 1650 to 1700 is set with rubies that are bordered with gold. For another take on “Maharaja,” read the review I wrote for kqed.org.